Here at What’s On we like championing our homegrown heroes, and if it’s a slice of local talent you’re after, we’ve rounded up ten of Dubai’s best chefs. But let’s not forget, the city is also full of international talents and a list stars of the culinary world. Here are 16 celebrity chefs with restaurants in Dubai. 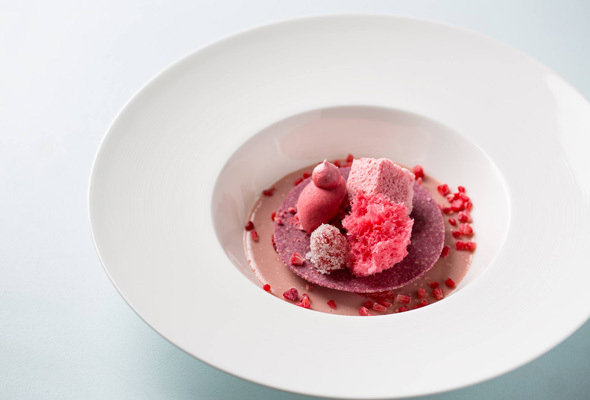 His restaurant in Italy, Osterica Francescana has been rated as the world’s best restaurant two years in a row. So, it’s safe to say chef Massimo Bottura knows a thing or two about top notch food. His first restaurant outside of Italy. Torno Subito, can be found at W Dubai – The Palm on the beachfront. Inspired by Massimo’s childhood on the Italian Riviera in the 1960s, it’s fit out is retro, playful and bold – and it comes with a menu to match. 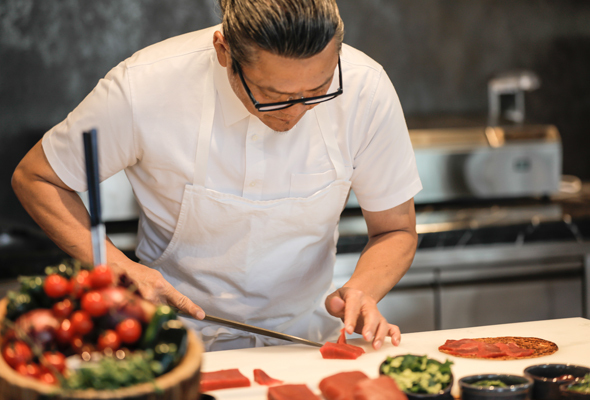 Korean chef and TV personality Akira Back is the second of two celebrity chefs to make their Dubai debut at W Dubai – The Palm. The restaurant cuisine is centrally Japanese, with Korean and pan-Asian influences running through it. Akira has restaurants in cities including Las Vegas, Bangkok, Singapore, Beverly Hills and Bali, and industry sources tell us that it won’t be too long until he’s got a second outpost in Dubai. 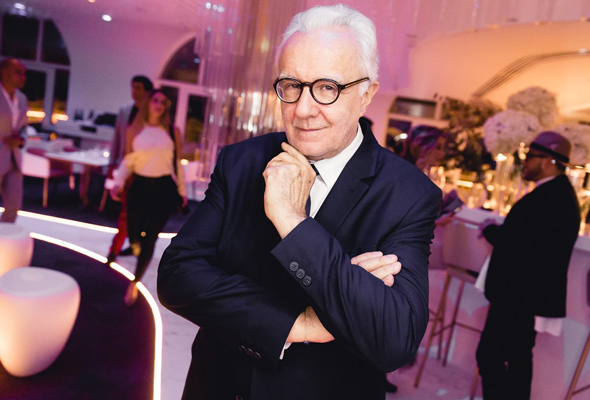 Alain Ducasse is famed for being one of the world’s most decorated chefs and around the world his restaurants have amassed an impressive 21 Michelin stars. In Dubai, you’ll find his restaurant, Mix Dubai, at Emerald Palace Kempinski Dubai on the Palm Jumeirah. Spread over three floors and with room for 400 guests, the stunning space features a separate bar and lounge, private chef’s table and central Faberge Egg, which spans three floors of the dramatic restaurant space. 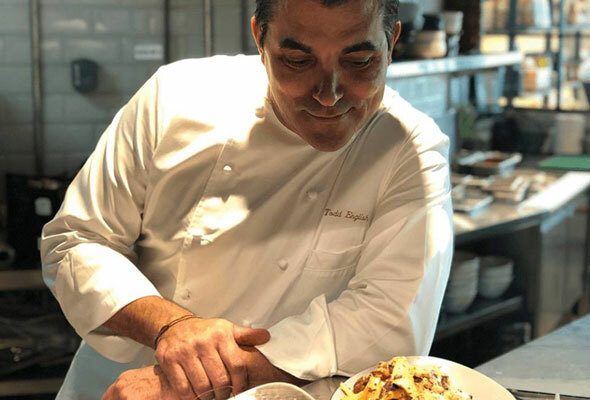 Chef Todd English, who’s actually American, has recently made his Dubai debut in the Fashion Avenue extension of the Dubai Mall. Called Todd English Food Hall, the super-sized venue covers an impressive 12,000 square feet. Serving up an international array of ‘gourmet food and drinks’, there’s no less than twelve open kitchens, so guests can see dishes cooked right before their eyes. 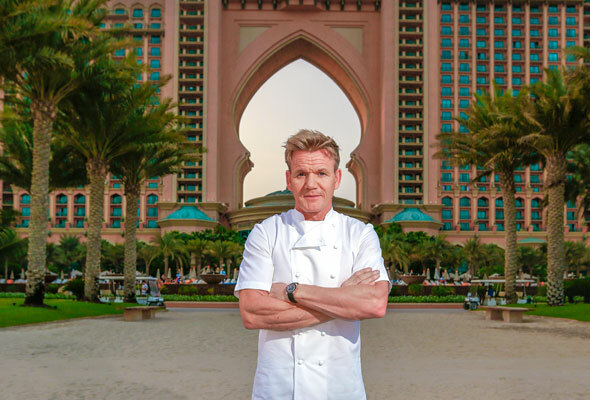 Gordon Ramsay now has two restaurants in Dubai. At Atlantis The Palm you’ll find Bread Street Kitchen, a more casual eatery compared to Ramsays first venue in the city, fine-dining restaurant Verre, which closed in 2011. His latest opening can be found at Caesars Palace Bluewaters Dubai, and is named after his popular TV show, Hell’s Kitchen. Masaharu Morimoto is best known as the star of the Japanese cooking show Iron Chef, as well as its spinoff, Iron Chef America. 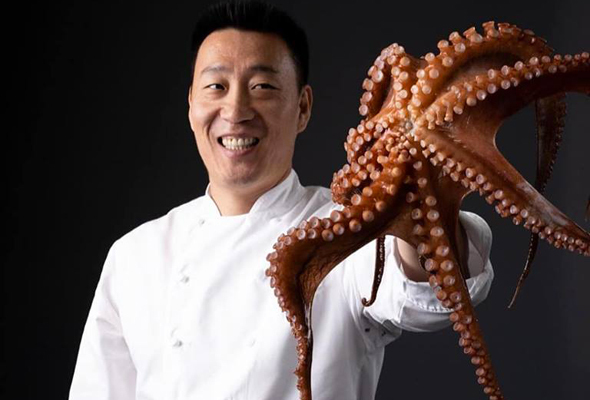 He opened his own restaurant, Morimoto, in Philadelphia in 2001, followed by branches in Mumbai, New York, and the Michelin star-rated Morimoto XEX in Tokyo. His super-sized Dubai outpost, which occupys the 23rd and 24th floor of the Renaissance Downtown, features traditional sushi served from a 24-seat sushi counter, and a live teppanyaki counter headed by one of Morimoto’s best teppan chefs from the Michelin-starred Tokyo restaurant. 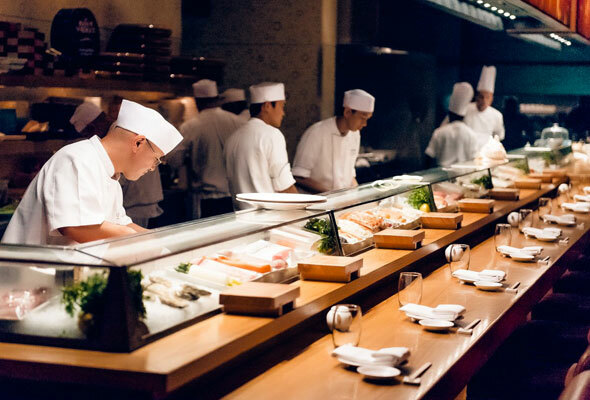 One of the world’s most recognisable chefs, Nobu Matsuhisa now has 40 restaurants around the world under the Nobu name. He regularly frequents his Dubai hotspot, taking part in meet and greets, cooking alongside some of the world’s top chefs, and hosting celebrity fans such as Jennifer Lopez. 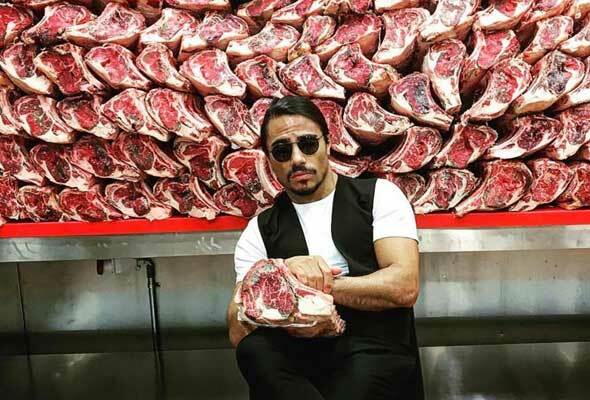 Nusret Gokce rose to fame in January 2017 after a video of him seasoning meat in his Dubai steakhouse went viral. The video, which earned Nusret his moniker ‘Salt Bae’ was viewed more than 10 million times. After this, the ‘Salt Bae’ sprinkle became a signature move at his Dubai steakhouse, for which you’ll need to book at least in advance (even when Salt Bae isn’t in the country) if you want to get a table. Unlike many of his counterparts, celebrity chef Gary Rhodes moved out to Dubai to focus completely and running his two venues. 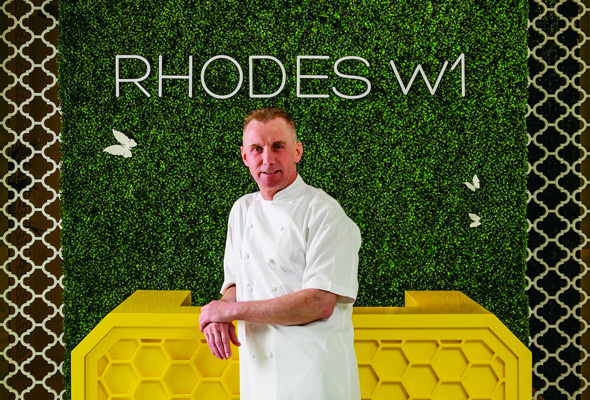 Both Rhodes W1 and Rhodes Twenty10 are still overseen by Rhodes, and you can often catch the British chef, who moved to Dubai in 2010, on the pots and pans. 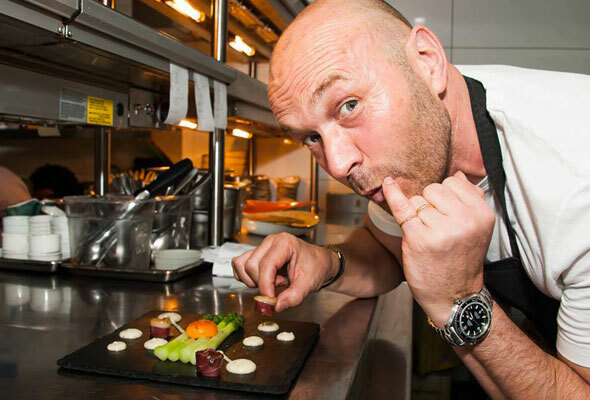 British chef turned TV personality Simon Rimmer opened his Dubai restaurant The Scene by Simon Rimmer three years ago in the picturesque Dubai Marina. Serving up classic British dishes from morning until late night, it’s popular with vegetarians thanks to a heavy focus on veggie-only dishes. It’s also a favourite with What’s On too, having won favourite British restaurant three years in a row. Serving contemporary fine dining Italian fare from a traditional dining room at the Waldorf Astoria, Social by Heinz Beck serve’s up some of Dubai’s top fine dining dishes. It’s a stunning location, looking out across the resort and if you’re lucky, you might even catch the German chef, who’s restaurants have amassed three Michelin stars, in the kitchen. 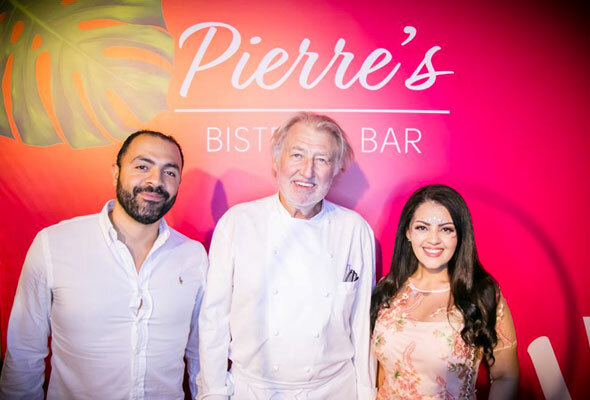 Pierre Gagnaire has had an outpost in Dubai for over a decade. His first restaurant, Relets, served fancy French food in Dubai Festival City from 2008 until it closed in 2016. In it’s place, Gagnaire opened Pierre’s Bistro & Bar earlier this year. It’s still serving up some Michelin-worthy modern European dishes, but this time in a more funky, casual setting. He became the youngest British chef to receive two Michelin stars when he was at the helm of Pied à Terre aged 26, and then went on to open several self-titled restaurants across London. 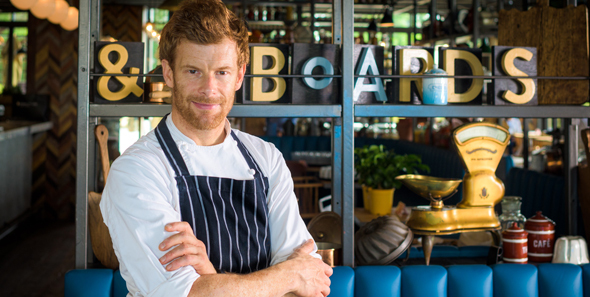 In Dubai Tom Aikens, a successful culinary author as well as chef, has a restaurant on The Beach, JBR called Pots, Pans and Boards. A collaboration with Reel Cinemas saw Guy Fieri open his first UAE outpost earlier this year in the Jebel Ali rec club. 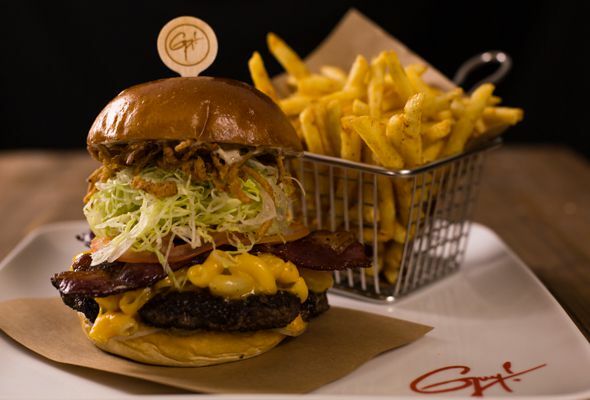 As well as serving up breakfast, brunch and some pretty Insta-worthy burgers in Guy Fieri’s Kitchen and Bar, you can also tuck into Fieri’s food (and a drink) while watching the latest releases on the big screen. Back for a third slice of the Dubai action, healthy eating campaigner and British celebrity chef Jamie Oliver has just opened Jamie’s Pizerria in JLT. 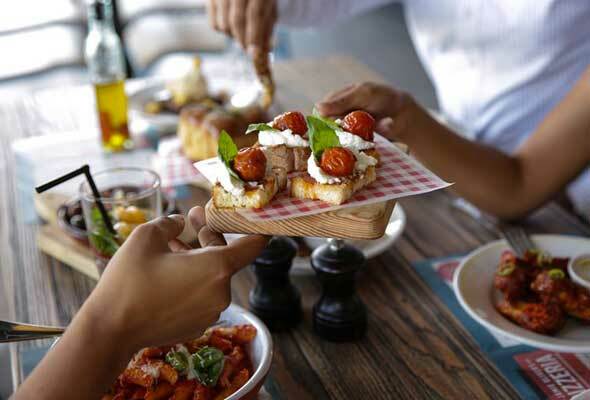 The unlicensed venue is the first Jamie’s Pizzeria in the region, and it follows on from the closures of both Jamie’s Italians in Festival City and Jumeirah Beach Hotel. Stay by Yannick Alleno is fine dining at it’s finest. The French chef was awarded three Michelin stars while chef de cuisine at La Meurice restaurant, which he departed in 2013. 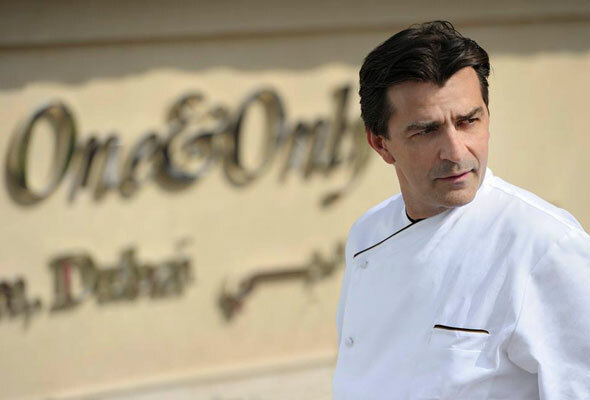 His Dubai restaurant at the One&Only on The Palm is approaching eight years of operation, and is still regarded as one of the city’s top fine dining restaurants. 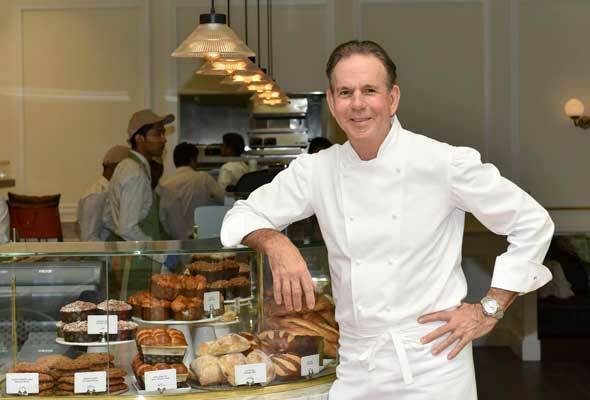 Acclaimed American chef Thomas Keller’s Bouchon Bakery can be found on The Beach, JBR. It’s the first of the celebrity chef’s Bouchon Bakeries outside of the US. Keller, who has amassed an impressive 7 Michelin stars across three of his restaurants. David Myers, known as the Gypsy Chef due to his love of travel, opened not one but two restaurants in the Renaissance Downtown at the end of last year. 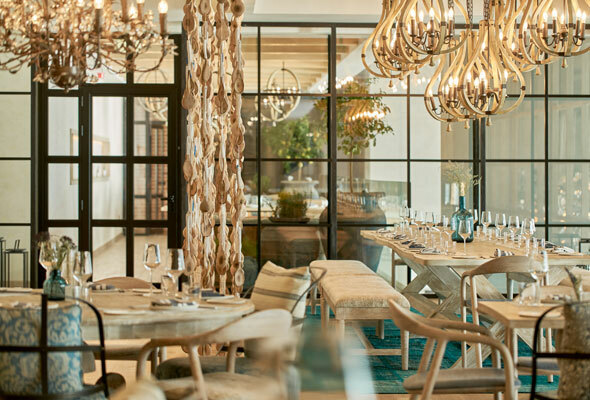 Refined French farmhouse food is served up at Bleu Blanc, and Italian fare influenced by the regions of Florence, Rome and Naples are the order of the day at Basta!. Bleu Blanc by David Myers and Basta, Renaissance Downtown, Business Bay. Tel: (04) 512 5533 (Bleu Blanc), (04) 512 5522 (Basta!). More info on Blue Blanc, More info on Basta! Set to be only the second international opening of the inventive restaurant, Dinner by Heston Blumenthal is scheduled for opening next year in The Royal Atlantis. It will serve up contemporary dishes inspired by historic gastronomic recipes dating back to the 1300s. One of the restaurant’s most iconic dishes is “Meat Fruit”, which looks exactly like a mandarin but is actually made from chicken liver parfait. 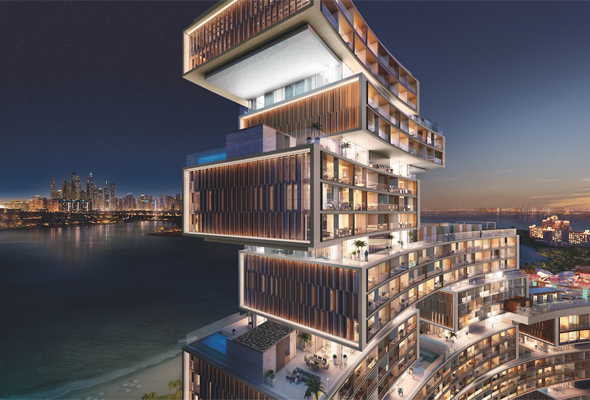 Dinner by Heston Blumenthal, The Royal Atlantis Resort & Residences, Coming 2019.